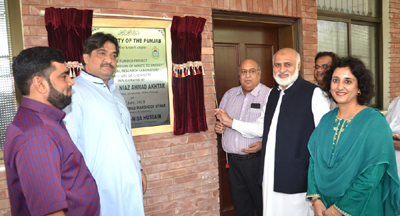 LAHORE: (Friday, August 17, 2018): Punjab University Vice Chancellor Prof Niaz Ahmad has inaugurated project labs at Institute of Chemistry. Institute of Chemistry Director Prof Dr Prof. Dr Muhammad Makshoof Athar, Principal investigator Dr Zaib-un-Nisa, senior faculty members and others were present on the occasion. Dr Zaib-un-Nisa briefed the research project worth Rs 71 million included transformation of waste to energy, establishment of industrial research laboratory for conversion of biomass/communal waste to energy. She said that the project had produced 3KV electricity and its capacity would be enhanced in future. The PU VC said there was need of such research projects that could contribute in the development of the country and betterment of the society.